Lovely old coloured (hand tinted probably) postcard of Church Street, with the Golden Lion on the right and Beatty Bros, the tailors / outfitters, on the corner of Victoria Street also prominent. Top centre is The Old Bank and to the left of that, the outline of The Old Bull. Very early 20th century, I would think. Although the Tram system was long gone before I was even born, I would have loved to have experienced a ride on one of them. PS. Who's nicked the horses from that carriage outside the Golden Lion ? Get over to Blackpool then John, they still had trams last time I was there. The Golden Lion was one of the main coaching inns, with stables around the back, so this photo will have been taken while the horses were being changed over or fed/watered/rested. Or maybe they just fancied a few pints of Dutton's finest and were sat at the bar. 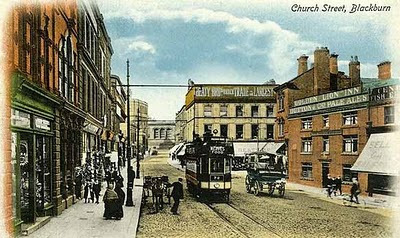 In the very early days of the Trams when there where only a few routes in existance, the Golden Lion was the main Boarding / Terminus point for the Trams. I've often wondered how they managed to get the overhead power lines on the Darwen Route under Darwen St Bridge without them actually touching the metalwork and electrocuting some poor sole leaning against one of the supporting pillars ! !